To Cite: Kushare I V, Oetgen M E, Walters S J. Spontaneous Hemarthrosis of the Knee - Late Complication of Flexible Femur Nailing: A Case Report, Trauma Mon. 2016 ; 21(4):e23063. doi: 10.5812/traumamon.23063. Local complications due to the nail tip after flexible intramedullary nailing of the femur are common (1), mostly in the immediate post-operative period. We present a case of acute knee hemarthrosis without inciting trauma, presenting seven months after flexible intramedullary nailing. An 8-year-old boy presented to our institution with a right midshaft femur fracture. He was treated with closed reduction of the fracture and stabilization with two 4.0 mm retrograde flexible titanium nails. Care was taken to ensure the entry points on the femur were 2 cm proximal to the distal femoral physis. The surgery and postoperative course was uneventful (Figure 1A - B). Figure 1. A, Pre-operative radiographs of femur fracture treated with flexible intramedullary nail; B, post-Operative radiographs of femur fracture treated with flexible intramedullary nails; C, radiograph 7 months after initial surgery. Seven months following surgery, the patient experienced a spontaneous knee effusion while sitting in school. He described no antecedent trauma, fevers, recent illness or travel. On examination he was afebrile, had a large effusion, diffuse tenderness, decreased range of motion of his knee and an antalgic gait. Blood work was obtained and revealed the following laboratory values: C-reactive protein: 0.31 (0.06 - 0.79), erthrocyte sedementation Rate: 22 (0 - 20), white blood count (WBC): 9.18 (4.3 - 11). Radiographs showed no osseous abnormalities (Figure 1C). Arthrocentesis of the knee produced 70 cc of bloody fluid which demonstrated WBC count- 1530 , red blood cell count -3,999,000, the gram stain and cultures were negative. Magnetic resonance imaging demonstrated a large effusion with generalized inflammatory reaction with no specific inflammation noted around the rod entry site. (Figure 2A). Figure 2. A, MRI of the knee; B, arthroscopic image - tip of the flexible nail protruding into the knee joint. Arthroscopic evaluation of the knee was done to assess any intra-articular pathology and showed generalized synovial reaction likely due to the hemarthrosis. The tip of the lateral entry nail was visualized protruding in the lateral gutter of the knee joint (Figure 2B ). We proceeded with removal of both flexible nails. Culture results and tests for Lyme disease were negative. The patient resumed unrestricted activities after 6 weeks and currently has full knee range of motion, normal gait and complete resolution of the hemarthrosis. 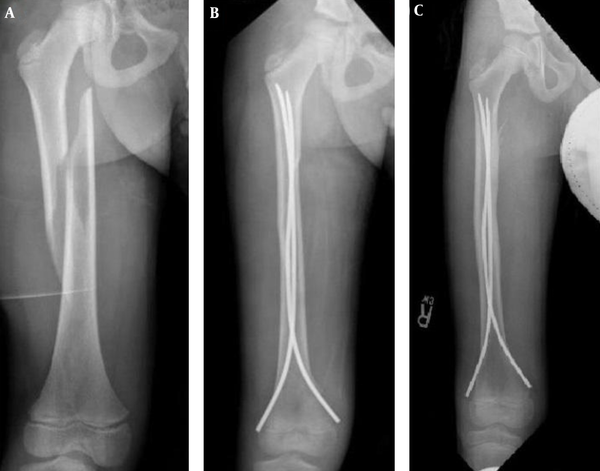 Complications due to flexible intramedullary nails to treat pediatric diaphyseal femur fractures include loss of reduction, nonunions, malunion and leg length discrepancy (2). Symptomatic hardware can be seen in up to 23% of patients (3). Local complications due to the nail tip prominence at the insertion site are the most commonly encountered complications (1), which include irritation of the local soft tissues, bursitis, and nail migrating through skin (4-6). To date, there is a paucity of literature describing late complications due to penetration of the knee joint by migration of a nail. 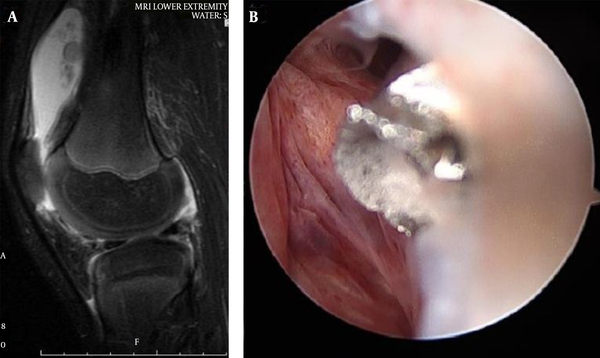 Rohde and colleagues (7) , reported a patient presenting with fever and chills associated with his knee pain and swelling, six months after nailing for femur fracture. In contrast, our case presented with spontaneous hemarthrosis of the knee without any fever. Their patient had resolution of symptoms after removal of hardware. This uncommon complication should serve as re-enforcement for proper nail entry which is 2 cm to 2.5 cm proximal the distal femoral physis (5, 8, 9) to prevent unintended erosion of the nail tip into the knee joint. An additional strategy to avoid this complication is the proper nail tip management. According to various authors including from Nancy, France the nail tip should be bent slightly outwards so as to facilitate the removal of the nail (1, 5). There is a fine balance between a slight outward bend and too much of a bend which leads to soft tissue irritation. It is likely in this case that the tip of the nail which was abutting the joint capsule eroded through the capsule over 7 months, as the patient continued to grow, resulting in a hemarthrosis. Some authors have recommended that the unbent nail should lie in close apposition to the supracondylar flare of the femur to prevent soft tissue tethering of the adjacent tissues (4). Careful attention to the knee capsule anatomy, proper positioning of the flexible nail entry points and proper tip management are important to potentially prevent this complication. Authors’ Contribution: Suzanne J Walters, made all treatment decisions regarding the patient’s care and treated the patient. She wrote and edited the manuscript and is guarantor. Matthew E Oetgen, proposed the case report, developed the case report protocol and assisted with the development and preparation of the manuscript. Indranil V Kushare, abstracted and analyzed data and contributed to the development, writing, and editing of the manuscript. Financial Disclosure: No authors have any financial interests related to the material in this manuscript.